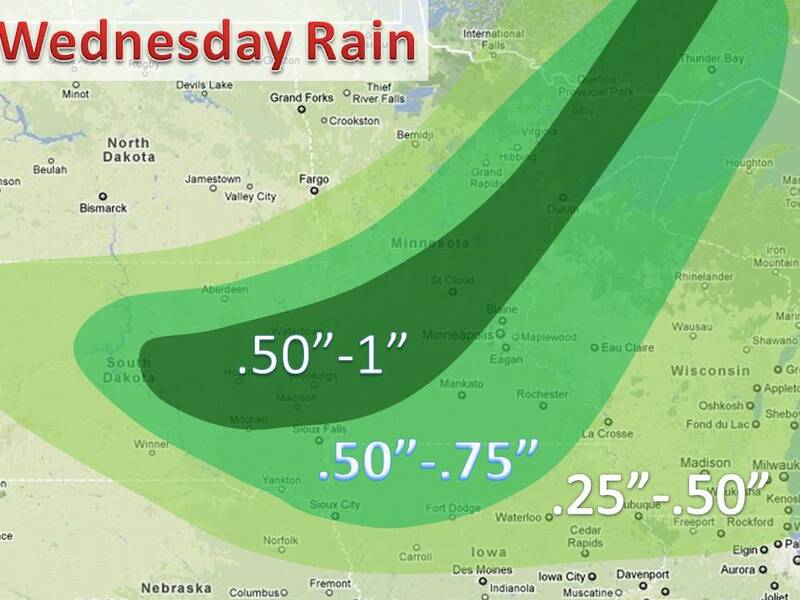 Two rounds of heavy rain will affect the Midwest over the next few days. A storm system will dive south from Canada overnight and spread rain into the upper Midwest and Great Plains, especially in Minnesota. Up to an inch of rain can be expected. A flood threat does exists in the arrowhead of Minnesota due to the snow storm Sunday night that dumped up to 11". The system will then rapidly continue into Canada and the rain should be down by Wednesday night, then we look ahead to Thursday stronger low pressure. 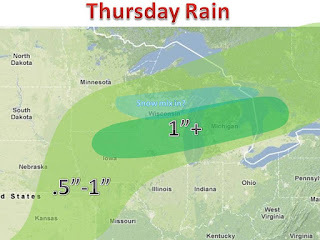 The next storm will come out of the Rockies on Thursday morning, rain will then develop Thursday afternoon. The system will rapidly intensify as it move towards the east and eventually the midwest. Heavy rain will fall across a large area, but up to 2" is possible in southern Wisconsin and northern Illinios. We do need to watch for the chance up snow on the northern side of the storm. If enough cold air can wrap in, an accumulating snow is possible Thursday night. stay tuned.